Before I begin, allow me to say something. (I have always found that line humorous, but you kind of have to think about it.) I don't like some of the answers I found in this survey. I have taught the exact opposite of what this survey reveals at some points. I disagree with some of these findings. But, the facts are the facts and I am going to report them just as they are. If you disagree with the findings, please don't shoot me, I am only the messenger. 1. Would you describe your class as. . . In each case, I divided the responses into two groups: the high and the low. If there were five possible answers, I threw out the middle ones and just compared the top group with the bottom group. I wanted to see as much contrast as possible. The question, then, becomes, "Are 4 and 5 star teachers any more likely to report they are growing than are 1 and 2 star teachers?" What would you guess? Here are the twelve predictors of growth sorted in the order of how much difference they make in predicting growth. I asked how teachers spent their time--on people inside the class or outside. I would have predicted that spending more time on people outside the class was a significant predictor of whether the class was growing. Turns out, I was wrong. Teachers who spend more time on people outside the class than people inside the class were 4% LESS likely to be growing their class. My take on that is this. If you ignore the people in your class, your class won't grow, no matter how much time you spend trying to get outsiders to join it. I drilled a little deeper and found something else interesting. I compared those who were on the extremes in this category--those who were reporting spending 80% or more of their time with the class vs. those who were reporting 80% or more with people outside the class. Those who were spending 80% or more of their time on outsiders were 12% more likely to be growing than those who were spending 80% of their time or more with people inside. Still, not a huge difference. Balance in all things. Jesus taught us to walk the narrow way. We need to minister to outsiders as well as insiders. 10. How does your group feel about the idea of growing and dividing your group? I taught for several years that if we are going to see a doubling group movement in our county, the groups themselves must embrace the vision of growing and dividing. A group of ten that doubles every eighteen months can reach a thousand people in ten years. Why isn't it happening? We don't want it to happen. The group must embrace the vision. Not so. There was almost no difference (2%) in the likelihood of growth between those in the top and those in the bottom of this scale. How do you explain this? Here is my explanation. Imagine you are rocking along, teaching a class, but not pushing them to grow and divide. How aware are you that the group is opposed to the vision of growing and dividing? How likely are you to report that your group is strongly opposed to the vision of growing and dividing? Not so much, right? Now, suppose you get bitten by the group multiplication bug. 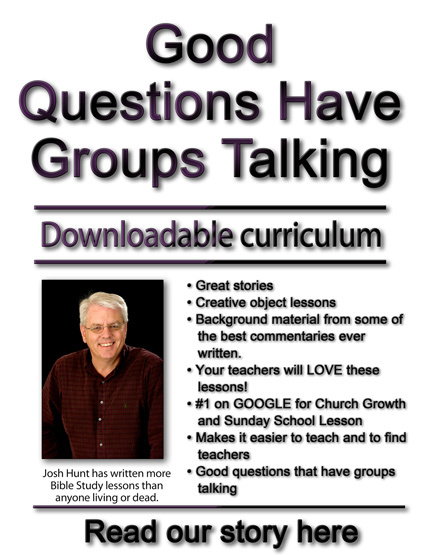 You start actively talking to your group about growing and dividing. What kind of response do you expect to get? How aware are you now of the group's resistance to the vision? How likely are you to report that your group is strongly opposed to the vision of growing and dividing? Very likely. The more the teacher has embraced the vision of growing and dividing, the more likely he or she is to be aware of the group's resistance. Eventually, as the teacher succeeds in growing and dividing the group more people get on board with the vision. In short, if a group has embraced the vision it is more likely to be growing. But, the more the vision is cast, the more aware the teacher is of the resistance. These factors offset each other. The lesson is this: if you want to grow and divide your group, you don't have to wait around for your group to get the vision. Growing groups do not grow and divide because their group has embraced the vision. Sometimes they have embraced the vision and sometimes they have not. This is the third thing in the "hardly matters at all" category. Teachers who report high organizational ability are only 7% more likely to be growing than those who report low organizational skill. Next week, we will look at things that matter.